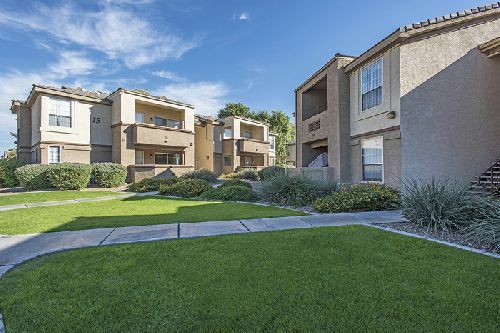 PCCP LLC has provided a $43.3 mil senior loan to an investment group consisting of R&V Management, Impact Multifamily, Wermers Properties and Loma Linda University for the acquisition and renovation of an apartment complec in Peoria, AZ. The property, Tuscany Ridge, is a Class A, 336‐unit, garden-style multifamily project situated on a 19‐acre site in Peoria, a northern suburb of Phoenix. Built in 2003 and located at 8203 West Oraibi Dr, Tuscany Ridge consists primarily of one‐ and two‐bedroom units with eight three‐bedroom units. The property is spread among 25 two‐story buildings that are separated by grassy common areas and walkways. Its high quality amenities include a 24‐hour fitness center, racquetball court, resort-style pool and spa, shaded playground, business center, select detached garages, and a large resident clubhouse. Located at the northwest corner of the Loop 101 Fwy, Tuscany Ridge is within the Arrowhead submarket of Phoenix, which has been seeing strong economic and residential growth. The community is also situated within walking distance of neighborhood retailers, convenience stores and restaurants, and is two miles from the Arrowhead Towne Center, a 1.4 msf, Class A regional shopping center anchored by Macy’s, JC Penny, Dillard’s and AMC Theatres. Residents are also proximate to an additional 1.3 msf of restaurants and retail that surrounds the Towne Center. The financing was arranged by Rocco Mandala of CBRE. Multifamily demand is high in Phoenix and its suburbs as the region is one of the fastest-growing metropolitan areas in the U.S. and is predicted to have the highest level of employment growth in 2017‐2018, resulting in the need for thousands of new rental units. Many young, well‐educated millennials have moved to Phoenix in recent years due to its low cost of living, attractive climate and expanding economic opportunities. The influx has created a strong talent pool, and many companies are thriving in the business-friendly Phoenix environment, with access to some of the largest universities in the country. The robust economic growth occurring in Phoenix is forecast to continue over the next few years.